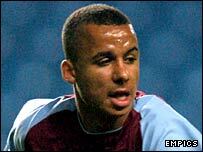 Sheffield Wednesday have signed teenage Aston Villa striker Gabriel Agbonlahor on a month's loan. The 19-year-old is yet to make his senior Villa debut, but recently made two League appearances in a loan spell at Championship side Watford. "We've seen him in some reserve games and he's very quick," Owls boss Paul Sturrock told his club's website. "He wants to play on the shoulder of defenders and get in behind them - we hope he'll benefit the team." Sturrock is also hoping to bring a second new striker to Hillsborough. He added: "We've been in negotiations with another club for the last couple of days. I'm hopeful we might be able to get something done next week."